Elle (Anna Hicks, center) is presented to the world. Is the world ready? 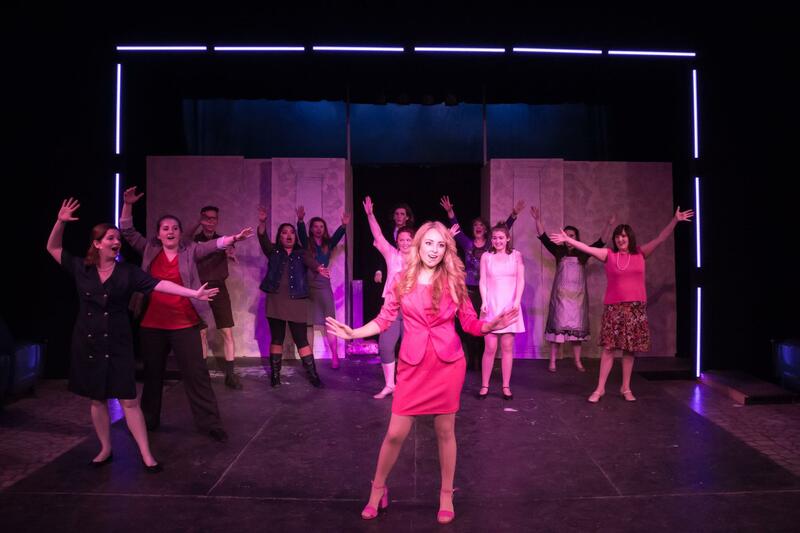 Waterworks Players’ Legally Blonde: The Musical is a joyous, rousing treat that brings community to community theater by casting student-actors from Longwood University and Hampden-Sydney College along with an ensemble of seasoned Waterworks actors from the Farmville community and beyond. Although five of the 11 cast members are making their debuts at Waterworks Theater itself, most of these young actors have solid experience in college theater. The play is based on the 2001 movie Legally Blonde, starring Reese Witherspoon, as well as on the novel by Amanda Brown. With an overarching focus of “Love never accepts defeat,” Delta Nu sorority president Elle Woods follows her broken heart and self-absorbed, ambitious former boyfriend to Harvard Law School, where her 4.0 average in Fashion Merchandizing from UCLA eventually wins the day. Entering Waterworks, theatergoers are treated to a bare stage; its backdrop pinkly lit with a heart of white light in the center, a color scheme that sets the mood — the fun and dazzle — for what we are about to behold. Humor abounds, and the dialogue and many featured songs are engagingly witty and droll. We even have a Greek chorus of spirited young women who are also literally in Greek Life as members of Delta Nu sorority. Rachel Witham, Laura Millon and Haley Mizelle play these roles with infectious delight. Director Mary Jo Stockton, known for her wonderful holiday pantomimes at Waterworks, brilliantly helms this ambitious show involving a company of 11 actors in the main cast, with 12 ensemble actors playing 20 different roles, as well as a production team and crew of 20-plus members. Costume designer Hannah Boswell deserves kudos for a wardrobe that enhances the production, particularly the eye candy of Elle’s clothes. The cast performs, sings and dances with infectious, upbeat enthusiasm that has audience members tapping toes and swaying with the music. Several actors deserve singling out. Delta Nu sorority president-turned Harvard law student Elle Woods is ably and admirably played by Anna Hicks is wonderfully cast: exuberant, engaging, fun, and most of all, believable as Elle. Mason Patrick conveys a nuanced blend of charm and snobbishness in his role as Elle’s ex-boyfriend Warner Huntington III. Kevin Koons, as Professor Callahan’s teaching assistant Emmett, is charming and pairs well with Elle. Miriam Loya, as beautician Paulette, is exceptionally good. With a powerful singing voice, she imbues her humorous lines with a deadpan delivery, impeccable timing and a great Boston accent. Madelyn Magnotti is totally believable in her role as cardio-fitness teacher/suspected murderer Brooke Wyndham, radiating both infectious energy (singing while jumping rope) and brave indignation at her trial. The Waterworks “regulars” also deserve accolades. Jordan Whiley, as Professor Callahan, is wonderful as a callous law professor who seeks blood from his opponents. His baritone brings Grinch-like flavor to the song “Blood in the Water.” Greg Tsigaridas, as the UPS guy is the, um, complete package — a pun you’ll get once you’ve seen the play. And Don Blaheta is a charm! Lastly, Leigh Lunsford is a delightful chameleon of expressions and voices and blissful dancing. On Broadway from 2007 to 2008, Legally Blonde: The Musical was nominated for seven Tony Awards, while its 2009 North American tour won “Touring Broadway” awards for Best New Touring Musical, Best Design and Best Choreography. It deserves these accolades, so if you don’t already have tickets, get them soon. Once again, Waterworks Players gives our community the gift of entertaining and pleasurable theater. As always, they do Farmville proud!